The Krispy Kreme brand has several unique elements that have helped create a special bond with customers. Our doughnuts, which are made from a secret recipe that has been in our company since 1937, have a one-of-a kind taste that generations of loyal customers have grown to love. 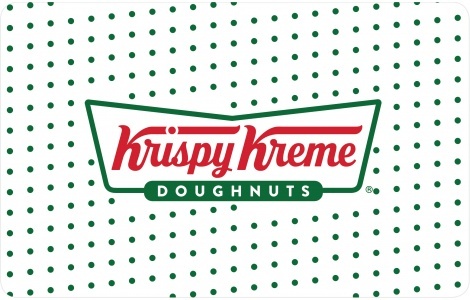 Krispy Kreme is a global retailer of premium-quality sweet treats, including its signature hot Original Glazed® doughnut. Headquartered in Winston-Salem, NC, the company has offered the highest-quality doughnuts and great-tasting coffee since it was founded. For store location and more information, visit KrispyKreme.com. For balance inquiries, visit a participating Krispy Kreme® retail store or KrispyKreme.com. For questions regarding this card, call 1-800-4KRISPY (1-800-457-4779). Only good at participating Krispy Kreme retail stores in the United States. Not redeemable at grocery stores, convenience stores or other locations that are not retail Krispy Kreme stores. This Krispy Kreme Gift Card is redeemable for product or merchandise only and may not be redeemed for cash, or replaced if lost, stolen, or damaged, except where required by law. There are no service fees or expiration dates connected with the use of this card. Fully customize a Visa(R) Reward Card with your logo or send Virtual Visa Reward Codes to your customers.